Where’s London’s oldest…livery company hall? The oldest livery company building, that of the Worshipful Society of Apothecaries of London, dates from just after the Great Fire of London in 1666. Originally built in 1672 to the designs of surveyor Edward Jerman, it replaced an earlier building which had been destroyed in the fire. It has since been refurbished several times and while the external facade appears as it did in the late 1700s, the interior layout, with Great Room – complete with original Irish Oak panelling, Court Hall and Parlour, is as it was when first built after the Great Fire. Previously members of the Grocer’s Company (and earlier still, the Guild of Pepperers), the Apothecaries Society was incorporated as a City livery company on 1st December, 1617, when it was granted a royal charter by King James I. They purchased a building in 1632, known then as Cobham House (previously owned by Lady Anne Howard), on land formerly part of Blackfriars Priory (see our former post on the priory here) – it was this building which was destroyed in 1666. Among treasures inside the current hall is a portrait of Gideon de Laune, Royal Apothecary to Queen Anne of Denmark, wife of King James I, and credited as founder of the Society which was was presented to the Society in 1641 and hangs in the Court Room. There’s also a 24-branch candelabrum in the Great Hall which was presented to the society by Sir Benjamin Rawling, Sheriff of London and Master of the Society in 1736. Now one of the largest of the livery companies in the City and still active in regulating medical practitioners, it is 58th in order of precedence and is still active in its trade with the organisation’s constitution requiring 85 per cent of the Society’s membership belong to the medical profession. Past luminaries have included the Romantic poet, John Keats. The society is also known for having established the Chelsea Physic Garden in 1673 – making it one of the oldest botanic gardens in the world – on land granted it by Sir Hans Sloane (see more on him in our earlier post here). The hall is available for hire. 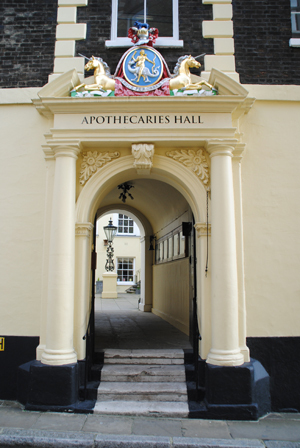 For more information on the Society, see www.apothecaries.org. Visits to the hall are by prior arrangement only. Contact the Beadle via the above website to find out more.